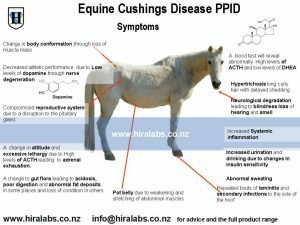 Cushings is a metabolic disease which is primarily a disruption to the endocrine system through excessive and prolonged stress and a higher than normal set point for cortisol. 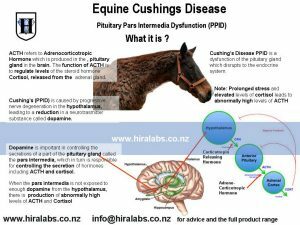 Cushing’s Disease is known as Pituitary Pars Intermedia Dysfunction or PPID, and is a dysfunction of the pituitary gland. 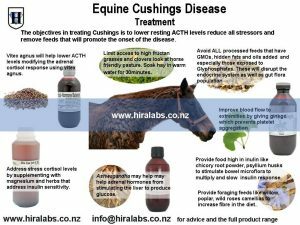 To maintain calm healthy horses is one way to ensure that they will not succumb to excessive stress which combined with age could lead to metabolic conditions like cushings, laminitis etc. 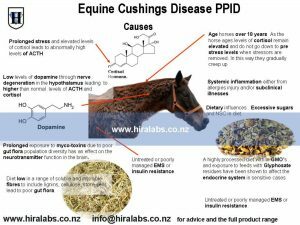 Cushing’s (PPID) is caused by progressive nerve degeneration within the area of the brain called the hypothalamus, leading to a reduction in a neurotrasmitter substance called dopamine. Dopamine is important in controlling the secretions via the pituitary gland which in turn is responsible for controlling the secretion of hormones including ACTH and cortisol. When the pituitary is not exposed to enough dopamine from the hypothalamus, the production of these hormones (ACTH) becomes abnormally high . ACTH refers to Adrenocorticotropic hormone is produced in the , pituitary gland in the brain. The function of ACTH is to regulate levels of the steroid hormone cortisol, which released from the adrenal gland. Too much and sustained will cortisol/stress will lead to cushings. Blood tests will reveal abnormally high levels of ACTH Adrenocorticotropic hormone which is often the end result of prolonged stress and elevated levels of cortisol. Change in body conformation through loss of muscle mass and a pot belly due to weakening and stretching of abdominal muscles. Decreased athletic performance due to loss of muscle integrity which leads to a change in attitude/lethargy. Recurrent bouts of laminitis, stone bruises and secondary infections to the sole of the hoof. Recurrent infections and delayed or poor wound healing due to compromised immune system. Disruption to the reproductive system ie absent reproductive cycle/infertility. In some cases puffiness above the eyes can be an early indicator of this and/or Insulin Resistance. 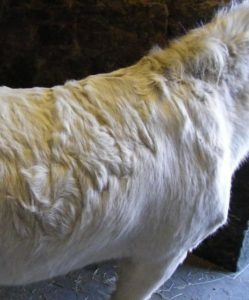 Age ; generally older horses especially ponies are more prone to this disease. Prolonged stress. This is not to be confused with neglect and cruelty though this would certainly contribute to its onset. I refer to more subtle form of stress from systemic inflammation, a predominantly hyper alert state, a horse that is exposed to situations that stress them and don’t respond well to desensitising training methods. Untreated or poorly managed EMS (Equine Metabolic Syndrome)or insulin resistence. Diet modifications because insulin and blood sugar metabolism may not be functioning properly so, avoid feeding traditional grains, treats or pasture because these can be high in sugars and starches. Provide low-sugar/high-fiber feed and add between half to one cup of coconut oil to feed as this will help reduce the insulin fluctuations. Feed coconut oil (MCT’s) are broken down immediately by saliva and gastric juice enzymes so that the pancreatic fat-digesting juices are not involved in their digestion. They are then broken down into medium chain fatty acids (MCFAs). Unlike other fatty acids these MCFA’s are absorbed directly from the intestines into the portal vein the then straight onto the liver. They are not packaged into lipoproteins like other fatty acids( tending to lay down fat) but are converted into fuel via the liver. This also helps help stabilize blood sugar. Providing Omega Oils to help address the inflammatory response. Chaste tree berry (Vitex agnus) is the one herb that is able to influence the pituitary gland which will help modify the stress axis responsible for the onset of this disease. Vitex agnus contains steroidal hormone precursors which works by regulating the pituitary gland, by sending signals to other glands instructing them of how much of each hormone to make. A study has shown that extracts of vitex agnes can bind to opiate receptors which could explain why intake of vitex reduces is sedating. Ashwagandha Withania somnifera is an adaptogen which is able to bring the endocrine system into balance as well as an is anti-inflammatory agent, and as an “adaptogen” (endurance enhancer) and able to reduce the effect of stress. Of note is that is also able to increase levels of available dopamine. (Something that is low in animals with Cushings. Its exact physiological effect can be found by following this link. http://www.hiralabs.co.nz/ashwagandha-2/. Ginkgo (Ginkgo biloba) can help with this condition by increasing turnover of both dopamine and serotonin ginkgo also reduces stress and anxiety by lowering levels of cortisol. High doses of vitamin C and vitamin B1 can also help with Cushings.